The Festool Vecturo OS 400 is an incredibly versatile tool that was made for carpenters and woodworkers. 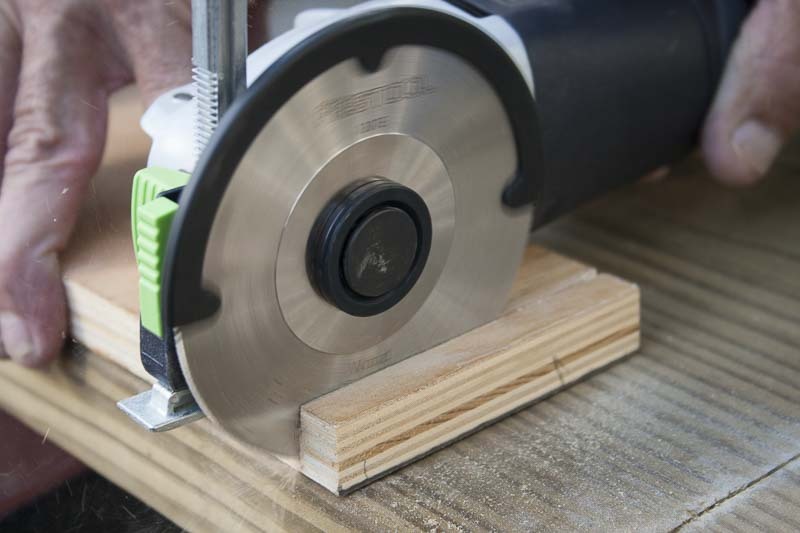 From cutting notches out for drawer guides to installing a newel post into a stair tread, this tool has the power, features, and accessories to get the job done confidently. I’ve had the Festool Vecturo OS 400 Multitool in my arsenal now for several months, and this is a completely different type of multitool than what you may be used to. I have a lot of experience with oscillating multi-tools, both corded and cordless, and the new Festool Vecturo takes on the high end, but with a decidedly woodworker angle. The nearest tool to compare the Vecturo with would be Fein’s Super Cut (which uses the same accessories by the way), but that’s a tool you see used a lot in commercial automotive windshield replacement. It’s perfect for that, and has the power and extra-wide arc to get that job done quickly. The Festool Vecturo OS 400 Multitool set, however, includes some innovative add-ons that make it perfect for making very accurate cuts—in both plunge and undercutting applications. The Vecturo OS 400 comes in a Systainer 2 box and includes a few accessories, including some very unique items that I’ll go into more detail later. The “Set” includes an adapter that lets you use the two depth stops as well as the positioning plunge-cut tool. It also includes a couple additional accessories. The Systainer also includes a plastic lid that gives you some additional space to store blades and other accessories. Editor’s Note: The test scores in this article, originally published December 4, 2014, have been updated to reflect the Vecturo’s performance in our recent Oscillating Tool Shootout. The Vecturo features the expected on-off switch, located on the top of the tool, as well as speed control and a nifty removable power cable. For blade changes, you don’t need any tools, you just lift up on the clamping lever and push it forward to remove the clamping element. The clamping element fits Festool accessories as well as some new accessories from Imperial Blades (and anything from the Fein SuperCut of course) and seats itself all the way down into the tool before you re-fasten the clamping lever to secure it fully. It’s a very easy system to use and gives you a lot of confidence that the blade isn’t going to shift or come out on you. Of the tool-less systems I’ve used, this is one of the easiest. Once the adapter is fitted to the Festool Vecturo (it comes pre-fitted on the “Set” version.) you can then attach the positioning aid and depth-setting accessories. For the positioning aid, you simply line up the arrows on the accessory with either of the arrows on the adapter and push it securely into place. You then rotate it to either side, at a 90 degree position, and it’s held in place securely. At this point you can press the green detent button on the front of the tool and rotate it into any of 7 positions (in 30º increments). The positioning aid is set up for plunge-cutting and it is truly unusual. In fact, I haven’t seen this on anything that wasn’t a router. If you bought the standard version of the Vecturo, the Vecturo Depth-Stop and Plunge Base Set (500251) can be purchased separately for around $169. Typically, when you plunge cut using an oscillating multi-tool blade, the accuracy of the cut is largely up to you. There’s a lot of room for drift—in all directions, really. The plunge cutting positioning aid has a magnet located on the base that literally attracts the plunge-cutting blade and keeps it flush to the metal base, allowing you to make an incredibly precise and sure cut. The blade can, of course, continue to oscillate sideways as needed, but any front-to-back- movement is prevented. This is great for when you’re cutting into finished hardwood wood or material where you’d need to get a perfect corner or unusual angle or shape. It’s a sophisticated accessory that’s really easy to use and will change the way you think about cutting out anything that requires a precise shape. The two straight depth stops attach in nearly the same way, and they both require the use of the depth stop adapter. After sliding on the adapter, you can again use the green detent button to rotate it as needed. The depth stop adapter fits both the plunge-cut depth stop as well as the depth stop shoe—both of which can be fitted by releasing the green matches lever. 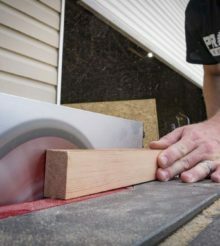 The shoe is unique in that it gives you a nice wide area to use as a guide when making linger cuts with a circular blade or cuts that need to be alongside a wall or piece of trim. It also rotates with the blade, as needed, so that you can begin a cut in one direction, and then get yourself additional clearance by finishing the cut from the other side. Startup on the Festool Vecturo OS400 is nice and smooth, with a quick ramp-up that isn’t artificially slow but simply cuts into the sudden inrush current associated with starting up a powerful 400-Watt motor. It also keeps the tool from jumping when you are using the plunge cut positioning aid. I immediately tested the Depth Stop to help me limit the depth of cut when cutting through drywall where I needed to avoid cutting too deep and hitting some electrical wires for a box I was cutting out. It works great, but it’s largely unremarkable—mostly because it does it’s job efficiently. The really fun accessory, however (beyond the positioning tool) was the depth stop shoe. When simulating a cut along and across 3/4″ oak flooring (which you’d do when cutting out a floor vent), the shoe did a great job of guiding the cut. It turns out, having that shoe—designed such as it is—let’s you worry more about your cut accuracy rather than the depth of the cut. You essentially set it how you need it and then turn your attention to making a clean line. And it’s super-easy to make a nice, straight cut along even hard wood. About the only issue we had was that the protective plastic guard affixed to the circular wood-cutting blade came off after just a little use. That didn’t bother us and we quickly discarded it and continued cutting. Using this method allowed me to make a much longer cut that I would have though possible or practical with a multi-tool using the circular blade. As a result, I finished the job much more quickly and precisely than if I had used a traditional blade and plunge cut the entire square access hole. As for technique, I preferred the shoe and blade angled slightly so that I cud more comfortably hold the tool from an upward angle. This was much better than my earlier attempts using a 90º positioning of the blade and shoe. The Plunge Base seemed particularly good for cutting out a square for a newel post in the bottom tread of a wooden staircase. This would work on new construction, but would be even more appropo if you were keeping a tread and replacing just the post. To test this out, we took a piece of 5/4 tread and drew out a square for our post. Then we grabbed the plunge base and attached it—and easy process. The Festool Vecturo cuts quickly. Even through tough oak it made quick headway into the wood, requiring only a few lifts on initial cuts to ensure that the sawdust could escape the hole and allow for continued cutting. Out side of the initial cut the OS 400 self-cleared the cutting path and moving the tool along the cut line was a simple act of sliding over the plunge-cut base and dropping the tool down once again. The plunge cut base was also handy for cutting out a rear access point on a desk where I needed clearance for some computer cables. It not only let me make a nice, straight cut, it also made it easier to control the tool from point to point as I made the rectangular access hole. I was impressed by the virtual elimination of blade “wander”. You’ve likely never experienced a multitool in this way, and it became very clear to me that Festool has taken the oscillating multitool and turned it into a precision tool that woodworking professionals are going to find extremely useful. There’s so much included with this tool (particularly in the Set version) that it’s hard to criticize anything. No one’s ever added a plunge-cut guide to a multi-tool before—and that takes this tool to a whole new level. There are really only a couple things missing on the Festool Vecturo OS 400. For one, there’s no dust collection option for this tool—admittedly a difficult option to add, particularly with the accessories. If anything, we’d like to ;ay down a challenge for Festool to come up with a solution more than we consider this a deficiency. If you’re worried about dust and keeping the workplace clean, you’ll need to have an assistant vacuum while you cut, or find some other solution. Also, there’s no visible depth gauge or depth stop for the positioning aid. This would be great feature to have as it would provide a way to limit the depth of cut with this incredibly useful accessory. The Festool Vecturo OS 400 Multi-tool retails for around $425 for the base tool (with Systainer 2 case and blade) and $575 for the full set including an upgraded Systainer 2 with “attic” compartment, the plunge-cut depth stops, the plunge-cut positioning aid, plus some additional blades and accessories. For more information, check out the Festool web page. I believe this tool is made by Fein. The accessories will fit the latest Fein multitool with only a little sanding of the plastic housing and without disassembly.